HissTank › Compatible Military Toys › Eagle Force Returns Update! We’re working to adjust the scale and redo our tooling. Here is a height pic with a Boss Fight H.A.C.K.S. figure so you can see where we are targeting. You won’t be hearing much from us through the holidays, so we wanted to wish you all the best wishes and Happy Holidays. 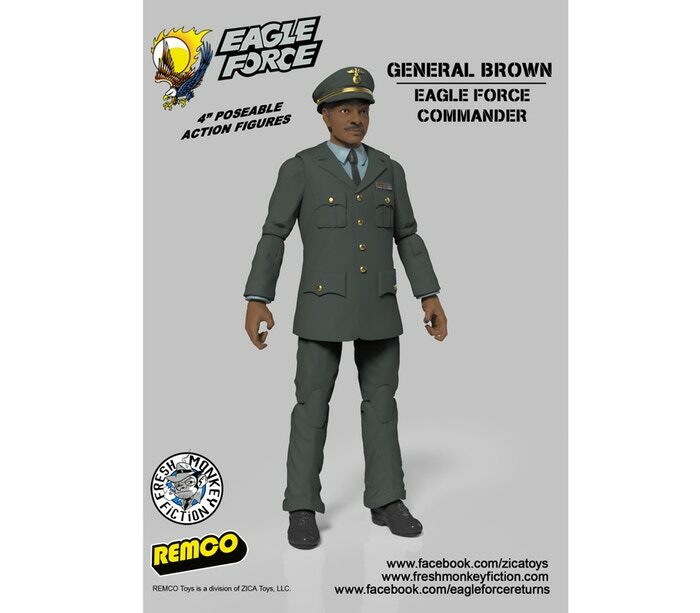 We’re looking forwards to getting Eagle Force out to you in 2018…We’ll leave you with an prototype image of General Brown from Eagle Force series 2. Didn't see it mentioned here so I'm posting this today. The good people at Boss Fight Studios are designing new figures in 1/18th scale based on the 1980's Mego property Eagle Force. Based on their collaboration with MGR's, it can mean nothing but great things to look forward to in 2015. Kinda surprised Boss Fight would directly compete with both Marauder and Hasbro. Well, maybe not so directly in Hasbro's case since this won't be mass-retail product, but still! It'll probably be pretty awesome...wonder if they're using the HACKS system on these? Holy smokes...I loved these as a kid. Fantastic news! Eagle Island is still a great iconic playset. I missed out on the MTF Kickstart as I had unexpected car repairs the week it closed. No way I'm letting this slip by. Oh yeah! Hope they're 1:18th-ish scale! I believe the MTF will be available to order directly from the Gun Runner's website after the initial Kickstarter orders are shipped out. You may still have a chance to get them. Someone check me on that. I remember being excited seeing the commercials for this line back in the day and becoming disappointed seeing them in real life at the store as the scale was incompatible with the Joes. Finally the scale issue has been corrected, only took 30+ years. Wow, I was thinking about these recently. "What were those little metal Joe-like figures with the plastic heads that had a blue ninja?".... I had a handful of them, thought they were cool. According to Boss Fight, these will be similar in design to Modern Era Joes. No mini metal figures to be had. I remember having that blue ninja as a kid. I'd love to see him done at 1/18 scale. I only had Stryker as a child. I'd like to get these in all in Joe scale though. I'm hoping for the good folks at Boss Fight to make us some 1/18th scale Buck Rogers, Battlestar, Sectaurs and Crystar figures.